Have you ever sent an email and just waited, not knowing whether recipients received or took action? Vocus.io tells you who, when, where, and how your email was opened. 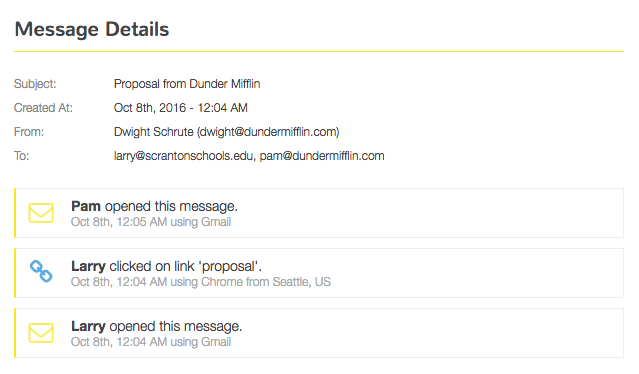 You will receive real-time notifications when someone opens your email or clicks on your links, all in one simple dashboard. If you want to, you can even get notifications on your phone or Slack whenever a hot lead is active. Emailing a prospect and CCing a colleague? Classical email tracking software fails to identify who among multiple recipients opened your email. Instead, it will say "Someone" opened your email, without details whether that someone is your prospect or your colleague. Vocus.io can distinguish between multiple recipients, and will know exactly who opened it, by name. You will receive an immediate, within a second notification on who opened your email or clicked on a link. This is a great way to know the right time to reach out to your prospects and engage them in a deeper conversation. You can personalize the domain name of your unsubscribe, open, and click tracking links. Avoid appearing to your prospects like a mass-mailing robot. Using Branded URLs, you'll be able to specify your own domain name, thereby improving your email deliverability score and get that extra notch of credibility. Learn more. From the dashboard, you can choose between detailed view (Stream) and metrics view (Trends). The trends view, pictured below, will accumulate your outgoing activity and compare it side by side with your team for the past period. Filters allow you to focus on yourself only or specific colleagues.